Given that every single second, google search engine performs 400,000 queries, we all know how important search is in our daily life. their existing customers or employees to find help, support and advice. Just imagine a home owner trying to re-mortgage his house for the very first time. He goes to his bank web site and searches for the keyword “renew my mortgage”. He gets all sort of results except what he is really looking for. But when he searches for the word “remortgage”, then he get the right answer. This is very frustrating and a proper Search implementation would have helped both the customer and the Bank. The same goes for a search for “Red shirt” where you get back most products from a brand called “Red Foo”. There are many example where businesses are loosing customers just because they do not have the right technology. And we strongly believe that every single organization, every single business and every enterprise needs a proper search solution. At Menelic, we go into extra length to make sure your clients, potential customers and employees get the right result whenever they perform a search. Most importantly, we spend a lot more time on the top search terms, making sure they always get the get the right hit. We have been running this cross DC SolrCloud cluster for over a year now and things have been working well for us. A couple of weeks ago, In one of our non production environment, our monitoring system went mad as our ZooKeeper quorum shot itself down, leaving our SolrCloud cluster in a read-only state. The network seemed OK and no other system was affected. However this was a non-production system, we spent some time investigating the issue by looking in the log and the system configuration files. The above log entries revealed that in the allocated time (time-out T), no follower was able to sync data from the leader ZK node with myid K.
The leader (with id K not) having enough follower to maintain the quorum of 5, deliberately shot itself down. 4 sec is definitely not enough for syncing SolrCloud config files data across multiple DCs. Now, we are giving 60sec to each ZK follower node to sync data with the leader. to your ZK start-up script. This will help avoid all sort of leader election issues (see  in the resources section below). You may want to change 2g to fit your need. – It is a good idea to leave enough RAM for the OS and monitor the ZK node to make it NEVER swap! I discussed about how HTTP compression helped us improve solr response time and reduce network traffic in our cross DC solrCloud deployment. 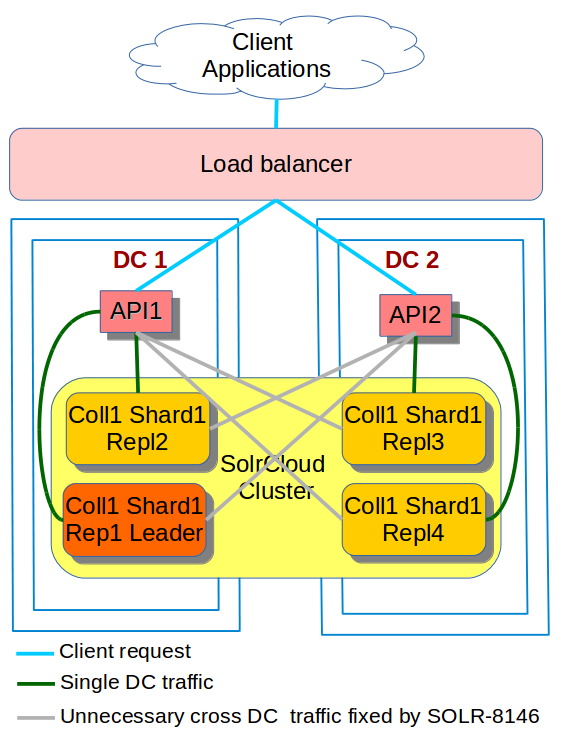 In our deployment model, we have only 1 shard per collection and in term of content, all SolrCloud nodes are identical. the API1 finally sends response back to the client. 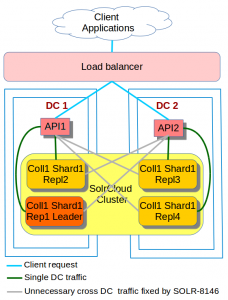 As stated earlier, all SolrCloud nodes have the very same content and are just replica of the same collection. The question is: why should API1 go all the way to repl4 in DC2 to fetch data that is also available in repl1 and repl2 in DC1? There is certainly a better way. Internally, the SolrJ client queries Zookeeper to find out the live replica of the collection being queried. SOLR-8146 only deals with read or query operations. Any admin or update or delete operation will not be affected by the patch. SOLR-8146 does not add to or remove nodes from the list of live solr nodes to query. it just re-order the list so that the one matching the specified pattern are first to be picked. In a SolrCloud cluster, one may want one of the nodes to be used for analytics and manual slow queries or batch processing. SOLR-8146 would help keep a specific node from SolrJ queries. SOLR-8146 brings more flexibility to the ways the SolrJ load balancer selects the nodes to query. This has many use cases. Hopefully, it will be useful to others too. After deploying our search platform across multiple DCs deployment, we load tested the Search API. We were not too impressed by the initial result. After investigation, it turned out that a large amount of search result was being transferred between the SolrCloud nodes and the search API. This is because clients were requesting a large number of documents. It turned out that this was a business requirement and we could not put a cap on this. Solr supports HTTP compression. This support is provided by the underlying Jetty Servlet Container. The next step is to set the gzip header on the client. The SolrJ client needs to send the HTTP header Accept-Encoding: gzip, deflate to the server. Only then, will the server respond with compressed data. Note that in the code above we not only enable compression on the client, but we also set soTimeout and connectionTimeout on the client. After changes, we dropped to 3000KB/s, that is serving just 25% of the original traffic, in other words, a drop of 75% of the network traffic! We have also seen a drop in response time by more than 60%! However HTTP compression can be very beneficial when serving large response, it is not always the answer. If possible, it’s better to serve small responses (for instance 10-40 items/pages). In the next blog, I will share some of the challenges we have been facing. Our objective is to deploy SolrCloud (5.X) across 2 DCs in active-active mode so that we still have all our search services available in the unfortunate event of a Data Centre loss. We used to run a Solr 3.x cluster in the traditional master-slave mode. This worked very well for us for many years. When Solr4 came out, we upgraded the cluster to the latest version of Solr, but still using the traditional master-slave architecture. Why the move to SolrCloud? The ability to avoid any single point of failure and make sure that the search platform is up and running in case one DC is lost. 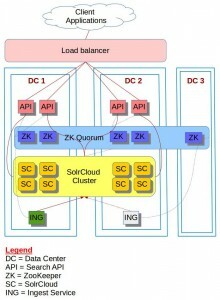 The initial goal was to have our SolrCloud cluster deployed in 2 DCs meaning a ZooKeeper cluster spanning across 2 DCs. 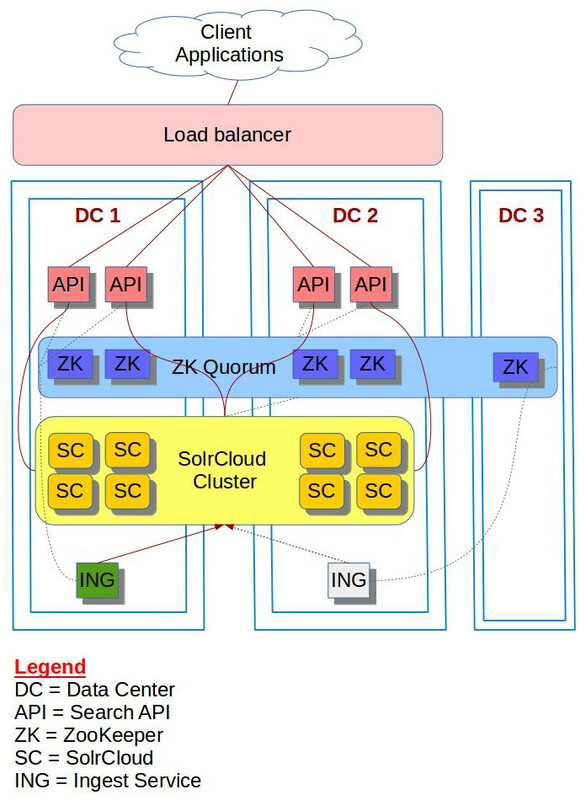 As of the time of this writing, for Solr 5.3 and ZooKeeper 3.4.6 to work in a redundant manner across multiple DCs, we need 3 DCs, the 3rd DC being used solely for hosting one ZK node in order to maintain the quorum in case one DC is lost. In summary, we have 3 private corporate DCs, connected with high speed gigabit fiber optic where the network latency is minimal. Note that we are well aware of the SOLR-6273 which is currently being implemented and the related blog entry at yonik.com . The Ingest Service used to push data through to the SolrCloud cluster. It’s build using SolrJ, so it talks to the ZK cluster as well. Note that the ingest Services run in a round-robin fashion and at a given moment, only one of them is actively ingesting. The other one would be in standby mode and will be activated only if it’s the first to “acquire the lock”. So, data flows from the active Ingest Service to the SolrCloud leader of a given collection regardless of the location of the Leader. This is API is built using SolrJ and is used by many client applications to search and suggestions. In this deployment model, the killer point here is DC connectivity latency. If there is high latency between the 3 DCs, this will inevitably kill our ZK quorum. In our specific case, all 3 DCs are UK based and have fat pipe connecting them together. During this process, we have come across many issues that we have managed to overcome them. In the next blog post, I will be sharing with you the challenges we faced and how we addressed them.